You are currently browsing the tag archive for the ‘bobcat’ tag. Woom! Bang-Boom! Smash! Splinter, crack, shatter. Debris crashes around me in a confusion of noise. The bobcat seesaws violently and comes to rest as another spear-sharp section of concrete roof panelling hits, exploding into razor shards. I freeze. Heart stopping shocked. For a moment I have no idea what’s happened. Everyone’s away this weekend. Robert’s on a hoverfly identification course near Shrewsbury and Olly at some friends’ house-warming party. I check on the cows at around eleven-thirty yesterday evening. Desiree is restless and her udder is full. I decide to pen her in case she calves. Desiree is the only one of my cows who is unpredictable and protective at calving. I make sure everything is as safe as possible in case I have to intervene. I check on her again in the early hours of the morning. Nothing doing – though by the time I go out to do the morning chores she is well into labour. Feeling very pleased she chosen such a sensible time I get on with mucking out, scraping down and feeding the main herd. As I’m scraping a large heap of dung breaks away and deposits itself outside Desiree’s pen. I make a mental note to miss it when I reverse back in. Reversing back up into the cow palace I turn to avoid the dumped heap, and out of the corner of my eye see Desiree beginning to heave. For a split second my attention slips, the bobcat hits the pile of dung; it’s thrown off balance, pitches forward and lurches backwards, my foot instinctively slams down (but bobcats don’t have breaks, they have hydraulic control pedals), the hydraulic arms and scraper fly into the air catching the high door lintel, with another violent seesaw the arms break down through the lintel and smash up through the roof. The whole incident is over in seconds. a day in the life...wrecked cow palace! Eventually the bobcat stabilises. I get out shakily and survey the wreckage. I feel weak. Miraculously Olly arrives on queue – he’s come home to give me a hand with the animals. No one has ever been more welcome! Despite the noise, chaos and ruins, Desiree quietly and purposefully carried on giving birth to a large healthy bull calf – with brains. Just as well, as after my debacle I sure didn’t feel like risking life and limb getting a calf onto the teat of a volatile cow! We are behind. Due to bluetongue vaccination we decided to leave mucking out the cow palace until after giving the cattle their second dose. Bringing in and sorting out different groups of cattle is a mucky business so it seemed only sensible to wait. 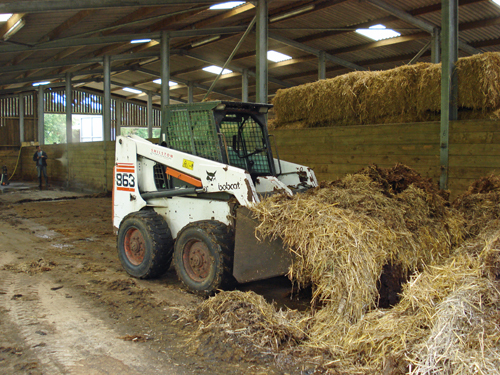 no, unfortunately, it’s not trained to muck-out by itself…I jumped out to take the photo. Today the forecast was for rain, which is perfect weather for mucking out. The mess made by the bobcat remains moist, doesn’t stick like chewing gum to the concrete and can be scraped off without use excessive amounts of expensive mains water. To prepare the yard we first have to remove all gates and posts – about fourteen large gates and seven small. 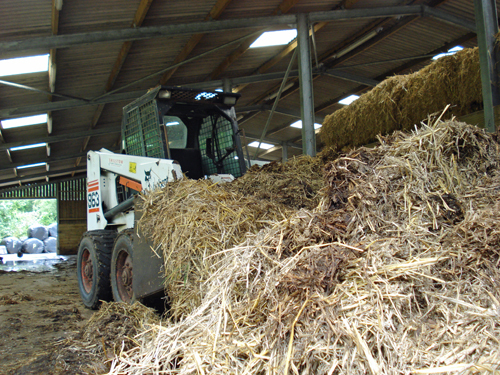 These are stacked outside and are pressure washed and disinfected once the yard is finished – the rain helps to soften and loosen the hard encrusted dung on them too. I have mucking out with the bobcat down to a fine art and once I’ve cleared a good start area I motor through in a couple of hours. 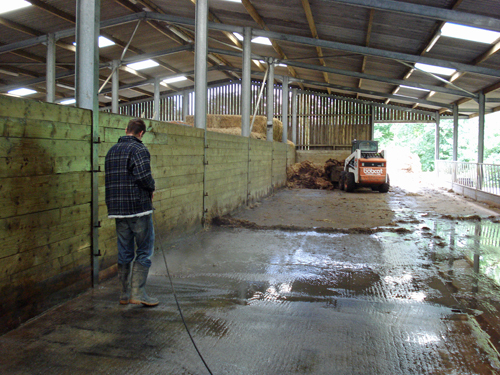 The tedious part is pressure washing and scraping – neither Olly nor I have found a quick, efficient method – it’s just a rather dreary slog. 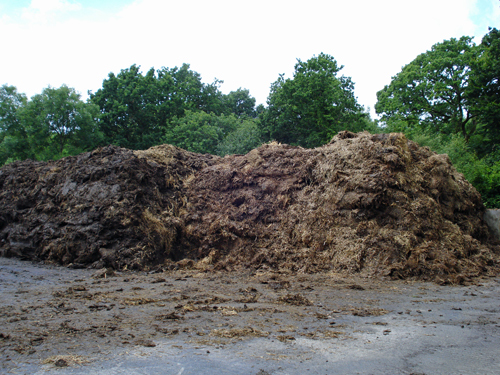 The farm is filled with the deep, rich sweet smell of wholesome organic farmyard manure, nothing like the acrid stench which often pervades the countryside. Ours is truly worth its weight in gold!